Just a few steps from the Caribbean sea, with the tropical rainforest in background, the spacious and tastefully decorated bungalows are privately set apart amidst lush gardens full of color and natural beauty. Designed and crafted in a unique style that blends traditional materials, exotic woods and thatched-palm roofs, with a modern building concept, each bungalow has a particular atmosphere. Each one comfortably lodge up to four people, with one queen size bed and two twin size beds, one of them placed in the mezzanine to provide privacy and wonderful spatial flexibility. All decorated with bamboo lamps and furniture, while ceiling fans, large windows with mosquito nets and high peaked roofs allow a refreshing natural air circulation..
Each bungalow comes with Cable TV LCD 32", minibar, security box and a softly lit original sauna-style bathroom that allows you to enjoy a shower while admiring the natural surroundings. Its own private deck and hammock out front, invites to relax and enjoy the colorful tropical gardens of the surroundings covered with bromeliads, heliconias, gingers, palms and tropical fruit trees, which interact with a great variety of birds and butterflies, as well as to listen to the different sounds of the jungle or just lie under a bright moonlight and sparkling stars. 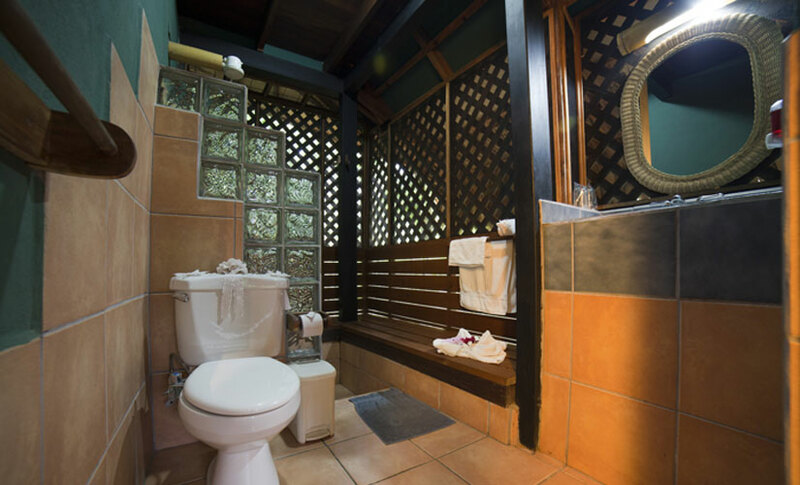 Azania Bungalows enhances the local charm and scenery by highlighting the simplicity, colorful charm and lifestyle typical of the South Caribbean, while constantly maintaining high standards of comfort, with great amenities and services inside each bungalow.